When people choose to make a change in their life, sometimes it can seem daunting and overwhelming. However, it doesn’t have to be that way, if you break it down into easy to follow steps. Moving towards a gluten free lifestyle is no different. So whether you are choosing to cut out ‘modern wheat’ from your diet, or you’ve chosen to go completely gluten free, there are some simple budgeting tips to keep you on track with your new goals. I’ve listed our favourite ones below. Look out for pantry staples such as nuts, seeds, canned goods and alternative nut and grain flours that are on sale and stock up when you can. Shop online as many companies often offer discounts when you purchase dry goods in bulk. Make your own dips, crackers, slices, cakes and bliss balls as it’s more affordable than buying them. When you make slices, cookies, muffins or crackers, double the batch and freeze them already portioned up. So when you run out and are in need of a snack, you can pull it out from the freezer as needed. Not only will you save money baking your own gluten free breads, cookies and cakes, but you’ll also be eating much healthier versions of the processed foods you’ll find in stores — with no scary additives, colours, flavours or preservatives. A pot of soup can really save you! Whenever you cut your veggies (celery, zucchini, carrots, onions, herbs and garlic) save the scraps and put them in a bowl in the freezer. Always save the bones from your leftover chicken drumsticks, wings, lamb, beef, turkey, duck and so on and also place them in a bowl in the freezer. When you have loads of bones and scraps place them into a large saucepan or use a slow cooker and top with filtered water and a splash of apple cider vinegar with a couple teaspoons of quality salt. Allow to cook them overnight (best done in the slow cooker as you can leave it on the auto setting) and you can then use this liquid in casseroles, to cook your vegetables in, as the base for soups, curries, stews or just drink it as a broth in a mug with extra salt, herbs, spices or lemon juice for flavour. 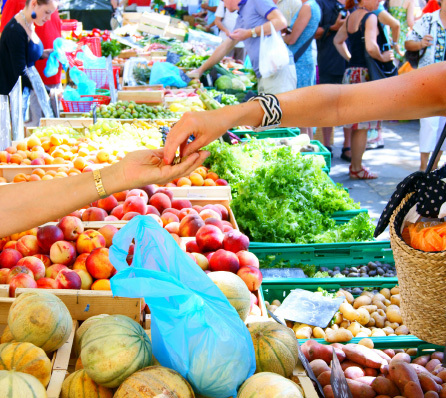 Buy your fresh fruit and vegetables from your local markets. Everything will be in season so it won’t have the ridiculous price tag attached. Save leftover vegetables and meat and then bake it with rice or egg and cheese the next day for a yummy baked casserole or frittata. If your diet is full of fresh fruits, vegetables, proteins and good quality fats, this not only allows you to stay satiated for longer, but it also limits the need to pay for specialty products and reduces the risk of inadvertently consuming gluten. You can avoid paying premium prices for gluten free foods simply by being organised, well-stocked and prepared. Bring a meal from home. Often you can make a week of gluten free lunches at home for the cost of one or two gluten-free lunches at a specialty cafe. Save money by putting the whole family on a gluten free diet. This prevents having to shop for two versions of everything and also saves you time in the kitchen so you don’t have to make different meals for every member of your family. Instead of buying expensive gluten free breads, pastries, noodles or pasta, use root vegetables in your meals instead. Root vegetables are a whole food. They’re higher in quality fibre that fill you up yet are lower in glycemic index so won’t affect your blood sugars as much and they contain vitamins and minerals that other gluten free options don’t. Root vegetables are also cheap! You can bake sweet potatoes, roast them, spiralise them into noodles and use as a go-to side dish in place of gluten free products. Sweet potatoes, regular potatoes, squash, pumpkin, carrots, beetroots, turnips, parsnips and onions all make amazing side dishes. They are a great addition to salads, lunches and dinners when roasted. You can store them all week in the fridge if you roast them in huge batches and portion them out. Thanks for the great tips because it is sure life changing to now have to eat gluten free! Tubers are not cheap. I was just lamenting this last week. They are a veggie after all, with high veggie-prices. CheapER than ridiculous glutenfree garbage, but not cheap. Greens are high priced too when you eat a ton of them. Its just life without grains or at least cheap grains like wheat and oats. Even rice, organic basmati brown rice, is $2.75-3/lb in bulk here. Steelcut oats are $1.76/lb, not organic tho. Rice I wont eat nonorganic. Good food takes good money. Saving up for other things in life is a bygone dream for most wheatfree ppl–who are eating truly healthy, not just wheatfree. Indeed, using the above tips helps, but eating quality food is not cheap. Great article, appreciated as wife and sister in law both celiac.